Summer is here! It’s time to look after your skin, and the best prevention to getting sun damage, ageing and the dreaded wrinkles is as simple using sun cream every day! Since I was a teenager, I always made sure that my moisturiser or foundation had an SPF already mixed in so I didn’t need to worry about applying sun cream underneath my make up. Whenever I did use sun cream under my make up I felt it was chip-shop greasy and leaving a shiny residue. I’m sure everyone can remember sun cream as a child! Thankfully, now that (a few) years have passed, skin cream technologies have improved. 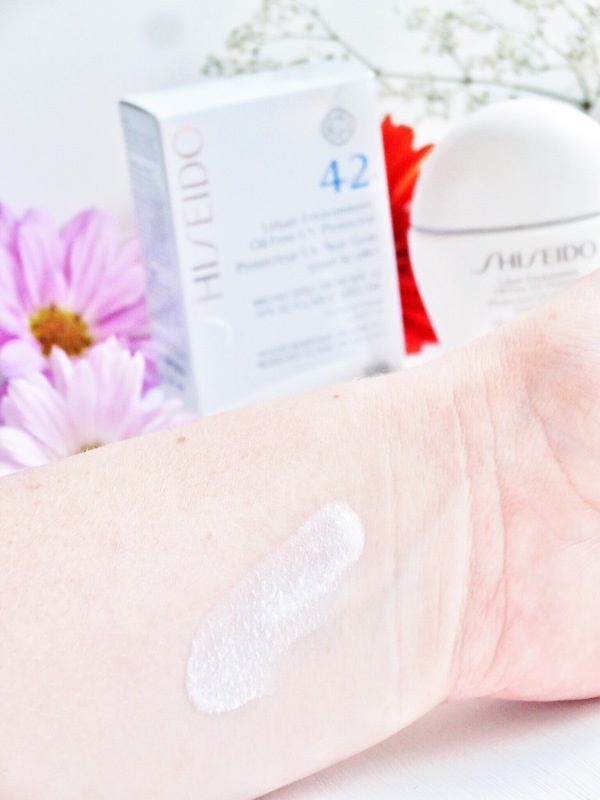 In this post I’m going to review the “Urban Environment Oil-Free UV Protector” by Shiseido. I was looking for a sun-cream that I could apply to my face, to use underneath make up and a sun-cream that did not leave a greasy residue. Also, I needed to add a sun-cream to my daily routine for the make-up free days as those days I had very little SPF in my moisturiser. As you know, I have recently moved to Toronto, Canada. Unfortunately a few weeks ago I suffered from an allergic reaction causing itchy angry sores across my face and neck. Still to this day, I have no idea what exactly my skin reacted to. I had been living in Toronto for about three/four weeks when the reaction occurred. 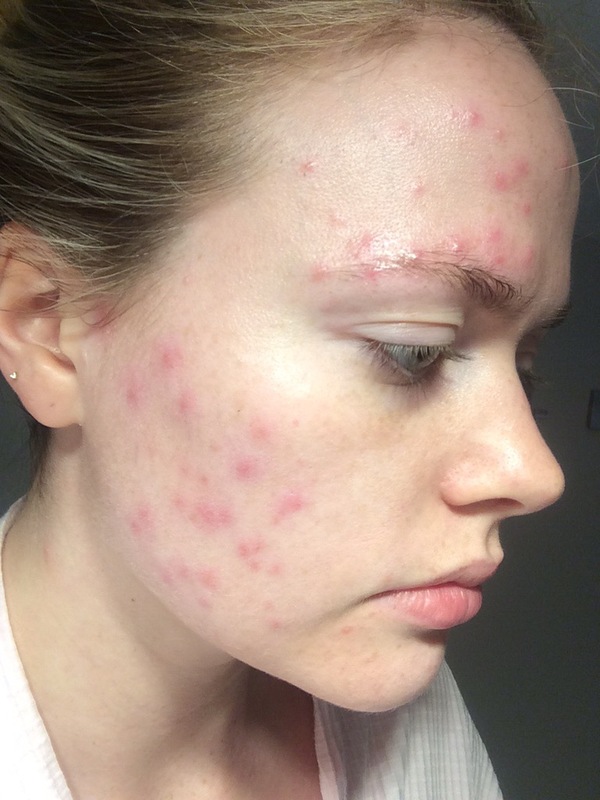 I was so worried that the adult acne I suffered from in Australia was on the way back.. I remember one day in particular during my reaction, I went to my local café, ordered a matcha latte and sat out in the sun writing in my note-book. While I was about four days into the healing reaction, that evening I noticed that the lumps were swelling yet again. Am I allergic to the sun? I wasn’t taking any chances so I decided I needed to find a sun protector for my face ASAP! My cleanser, toner, and moisturiser are already Shiseido, I’m very happy with this brand so I went into Sephora in the Eaton Centre in Toronto and scoped out the brands SPF. 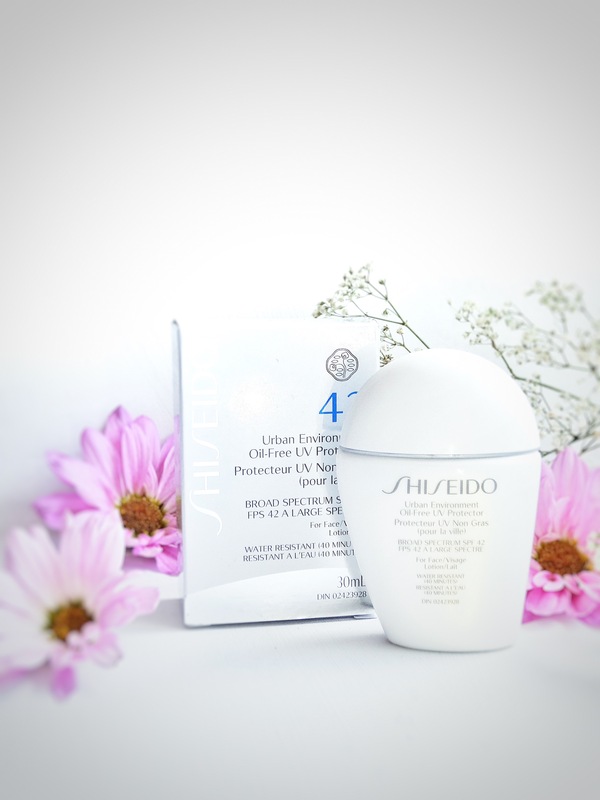 Shiseido have quite a selection of SPF products on offer which is fantastic as everyone can find one best suited to their needs or skin type. 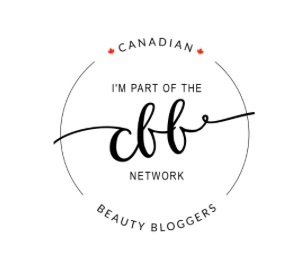 I chose this product because I have a combination skin type. I have an oily t-zone and I’m dryer around the edges of my face. After consulting with the assistant in Sephora she recommended I use the “oil-free” product and to use after I have applied my moisturiser. An ultra-light, oil-free sun protection lotion for the face that controls excess sebum and gives skin a matte appearance while guarding against daily environmental aggressors. Promotes the natural beauty of skin by protecting against the three major causes of skin cell damage – UV rays, oxidation and over-production of sebum – for beautiful, healthy-looking skin. The product contains Paeonia Albiflora Root Extract helps reduce the look of visible pores and Scutellaria Baicalensis Extract which helps promote the appearance of youthful-looking skin. I am very impressed with this product. My first impression was that the product is a milky light-weight consistency, easy to spread and dries in quick leaving no residue. It soaks up and oils and keeps the oil away throughout the day. It is perfect underneath make up, I found it didn’t affect my make up application whatsoever! Make sure to shake the product before use. There is a handy little ball inside to melodically aid you shake and mix the product for perfect consistency. It has a very high SPF of 42, I haven’t had any burning issues since I’ve been using this product. My initial concern was that it applied slightly white, but then realised that once it oxidises you wouldn’t notice it on your skin at all. Also, the size of the bottle for the price I paid, I’m worried if it will run out very quickly. I paid C$37 for 1 oz bottle. It blends in well and a little goes a long way so I’m interested in seeing how long one bottle will last. Thankfully, my allergic reaction has cleared and I haven’t had one since! I will keep on using this SPF with my daily beauty routine and I’m genuinely very satisfied with the product. I would highly recommend this product to anyone who has issues with sun-cream leaving the skin too oily. There is also a sun protector in the same line for people who don’t suffer with oily skin. Have you incorporated a SPF into your daily routine? I’m interested to know what everyone else has been using, let me know in the comments below. I hope everyone is enjoying the lovely weather and long may it last! I’m actually using this one as well at the recommendation of my cousin, and have recommended it to several people since purchasing it! It applies beautifully. How long did your bottle end up lasting you? I bought mine in June and so far still have half a bottle left even after I’ve applied the product every day. I really use very little and make it spread! Mine lasted about 6 months but definitely wasn’t disciplined and didn’t use it everyday.. got a fresh bottle recently so going to use it every day without fail and see how long it will turkey last.. so glad you are enjoying it! 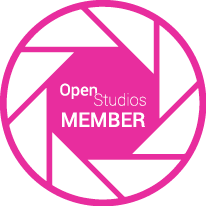 I’ve recommended it to many many people at this stage too.. thanks so much for your comment!! Anytime! That’s impressive; I must not be using very much and I’ve had mine for over 6 months with still a 1/3 of the bottle left. I read Little Book of Skincare a couple months ago, and the emphasis on the importance of sunscreen rubbed off on me, haha. I’ve never worn sunscreen in the winter until this year!